Motorpace racing was glamorous but dangerous. 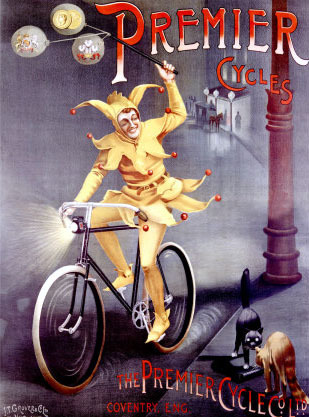 Falls were common, largely because bicycle tires tended to burst at speed. The riders wore neither helmets nor gloves. They depended on fast reflexes, the rude health of youth, and luck. Despite having all three, Bobby Walthour collected an impressive (or dismaying) inventory of injuries over his career: 28 fractures of the right collarbone, 18 of the left, 32 broken ribs, and 60 stitches to his face and head. Once, according to family history, he was given up for dead in Paris and taken to a morgue, where he regained consciousness on the slab. Cycle racing was the world’s leading spectator sport in the 1890s, and there was always pressure to establish new speed records. A racing cyclist could improve his speed by racing behind the slipstream of faster machines. In the beginning, the fastest bicycles were pacing tandems. But towards the end of the nineteenth century automobile engines were adapted and fitted to pacing ‘motor bicycles’ or ‘motor tandems’. These new-fangled motorcycles were monstrous machines, and dangerous in an unregulated sport. Nevertheless they did allow for greater cyclist speeds, and they were very popular with the crowds who attended cycle races. ‘Stayer’ bicycles were specially constructed to race behind the motorised pacers. In fact, such was the popularity of the motorised machines that, they helped provide the foundation for a new sport – motorcycle racing. As you can read below, a bicycle constructed of Premier’s patent helical tubing enabled the weight of its frame to be reduced by 25%, making it an ideal pacing machine. The example featured here has a hickory handlebar to reduce the weight further. It’s fitted with a 11 inch racing chainwheel. Compare this Premier with the old photos of the ‘stayers’ behind the motorcycles, which have drop handlebars and smaller front wheels. There was both professional and amateur cycle racing. Both attracted a dedicated public following at the turn of the century. Professional racing cyclists had sponsors and rode specially-built lightweight bicycles supplied by cycle manufacturers. Amateurs could also order special machines from the factory, but also rode their own bicycles, removing all unnecessary parts when competing. This machine has a rear brake and lamp bracket (neither needed for racing) and you can see it normally had mudguards fitted (hole in the fork crown for a nut and bolt). It’s a normal production lightweight bicycle adapted for racing with the addition of a racing chainwheel. I recently purchased this machine, and collected it yesterday when I met the supplier at the National Motor Museum in the New Forest, Hampshire. I took advantage of the location and good weather to photograph it at Beaulieu village pond nearby. I’ll fit matching tyres and service it in due course. With the coming of the pneumatic tyre, the need arose for a light and responsive frame of thin walled steel tube, but there were limits to how thin and therefore how light ordinary tubing could be made, before its efficiency was impaired. Helical tubing was developed and tested during 1891–2 and introduced in the autumn of 1892. These strange looking spirally wound tubes were the result of experiments to convert very high carbon bright rolled Swedish steel into tubes without reducing the carbon content. The chosen steel was non-ductile, in other words it was not capable of being drawn into steel tubes in the usual way without loss of strength.The solution found was to helically roll a thin sheet of steel varying from 0.008in to 0.017in thickness round a mandrel. A clamp was placed on one end to prevent its unwinding and the mandrel was withdrawn. A stout collar was then driven on the free end, and the whole tube brazed together. The brazing operation was carefully designed so that a complete film of brass was spread between the two layers of thin sheet mak- ing up the tube. Premier claimed that the brazing process was so perfect that every tube could be rung like a bell. In this way the tubes were tested and either rejected or passed fit for use. * Roger Armstrong is a bicycle collector and historian, and the marque specialist for Premier cycles. His article on helical tubing appeared in Boneshaker, issue 167, Spring 2005.